All the taste of Grandma’s cookies, but none of the fat! These Vegan Oatmeal Raisin Cookies are oil-free, dairy-free, and egg-free, with only 88 calories and 1 gram of fat per cookie! 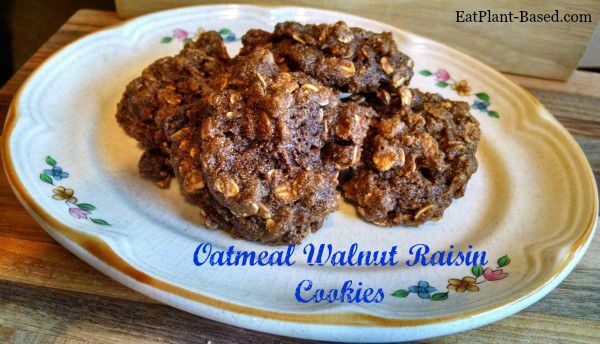 Oatmeal Walnut Raisin Cookies tastes like Grandma’s. The way we avoid baking these with eggs is to use a mixture of flax seed and water. In a blender, whip together the flaxseed with the water until thick and creamy. The consistency will be somewhat gelatinous and look like this picture. 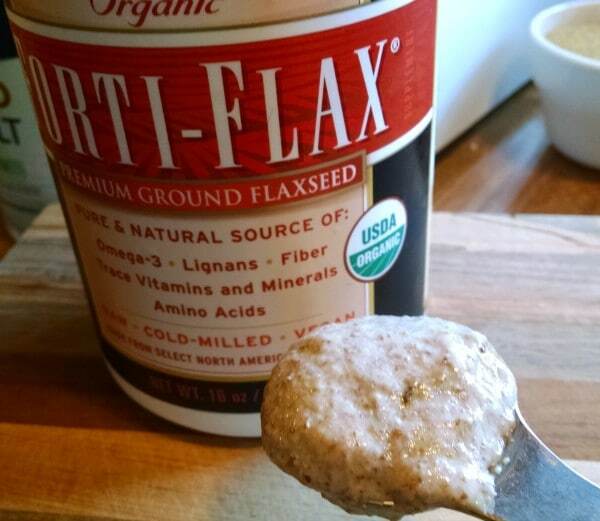 Flax eggs are simple to make and have the consistency of egg whites. The apple sauce in this oatmeal cookie recipe keeps the batter moist without needing to add any oil. I never would have believed that before switching to a plant-based lifestyle, because I had always baked with oil and thought that was required in order to have moist sweets. I was pleasantly surprised to find out that I was wrong. 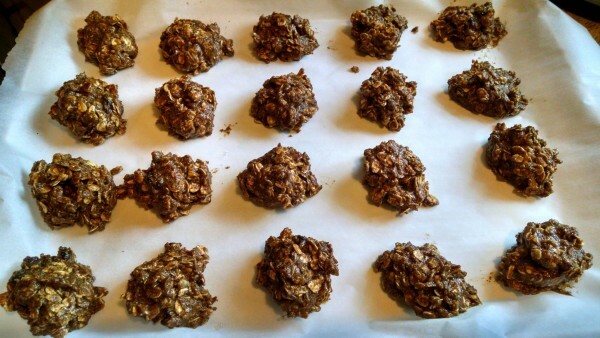 Simple ingredients to make these deliciously healthy cookies. 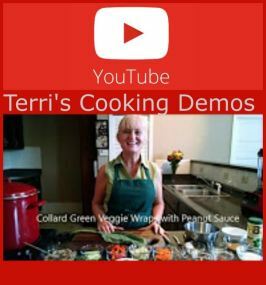 For more tips on oil-free cooking, check out my article, Cooking Without Oil. 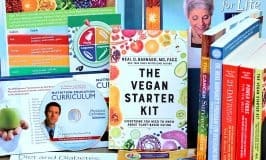 There’s even a short video showing how I make a stir fry using veggie broth instead of oil. In a blender, whip together the flaxseed with the water until thick and creamy. 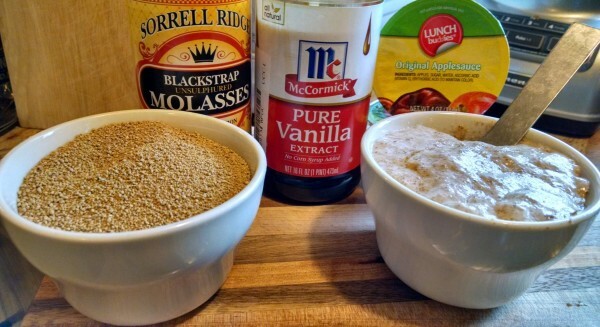 By hand or using an electric mixer cream together the apple sauce, sugar, vanilla, molasses, and flaxseed mixture until well blended. 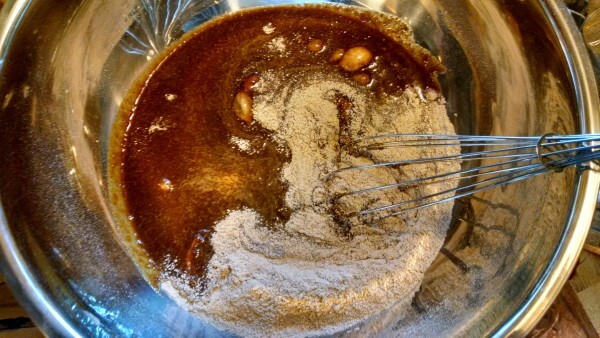 In a separate bowl, thoroughly combine the flour, baking soda, baking powder, salt, cinnamon, and nutmeg. Add to the creamy mixture and mix until well blended and smooth. 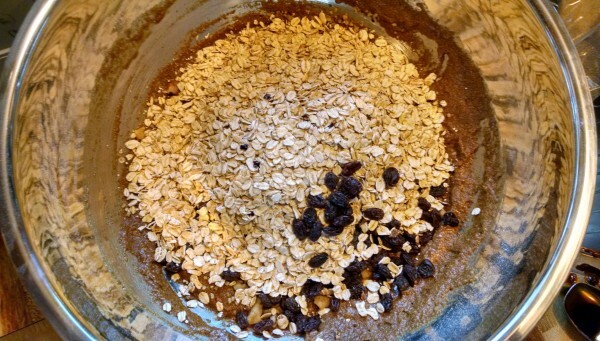 Stir in the rolled oats, walnuts, and raisins until thoroughly combined. Scoop dough with tablespoon onto prepared cookie sheet. With lightly wet hands, press to form ½ inch thick rounds. Bake at 350 degrees until the cookies are golden brown, about 12-15 minutes. Remove from the oven and allow the cookies to firm up for a few minutes while still on the cookie sheet. Full recipe with ingredients is below in the recipe card. I bake these on a parchment paper on silicone baking mat to keep these completely oil-free. 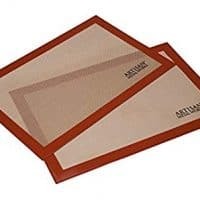 Baking on parchment paper eliminates the need for cooking spray. I make these a lot when I’m baking for family or social functions. One batch makes 42 cookies so, if you’re making them just for the family, you might want to make a half-batch or freeze leftovers for later. 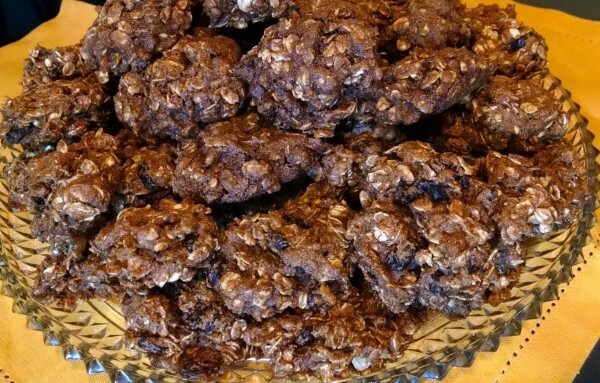 These vegan oatmeal cookies are always a hit! These cookies are not gluten-free, but this link to the Minimalist Baker will help adjust it for those that want to give it a try. Homemade cookies that taste like Grandma’s. All the taste of Grandma's cookies, but none of the fat! These little vegan oatmeal raisin cookies are oil-free, dairy-free, and egg-free, with only 88 calories and 1 gram of fat per cookie! 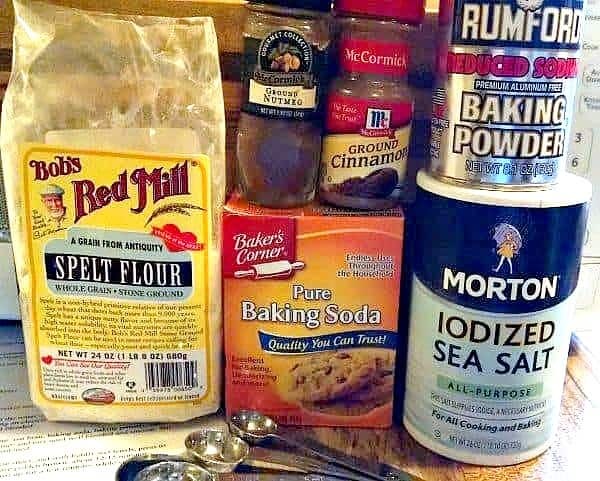 This recipe makes a whopping 42 cookies, so you may want to cut the recipe in half unless taking to a function. 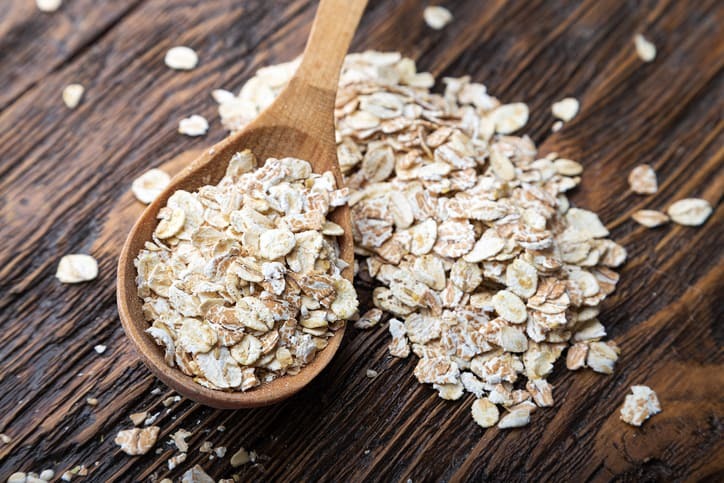 In a blender, whip together the flaxseed with the water until thick and creamy. The consistency will be somewhat gelatinous and look like this. It will look like this when blended. Scoop dough with tablespoon onto prepared cookie sheet, and with lightly wet hands, press to form ½ inch thick rounds. Bake until the cookies are golden brown, about 12-15 minutes. Remove from the oven and allow the cookies to firm up for a few minutes while still on the cookie sheet. Serve. Store cookies in an air-tight container to retain moistness. 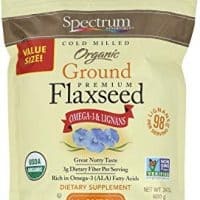 Spectrum Essentials Organic Ground Flaxseed, 24 oz. 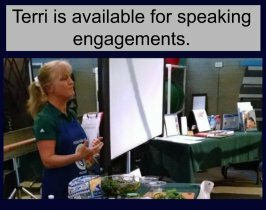 These look wonderful Terri, as all your recipes do. Is there any way to print them in a “printer friendly” format? Thank you! Hi Debra, the recipe plugin I use won’t allow me to adjust the print options (it’s a free plugin with no frills, unfortunately). However, when you click on the ‘Print’ button on the recipe, it asks which pages to print. On this particular recipe, if not specified it will print all 3 pages. You only need the first 2 pages, as the 3rd page is an ad. When it asks which pages to print, just type in 1-2, and it will leave off the last page. I hope this helps and that you enjoy the cookies! Karen, so sorry you’re having problems with printing this. I just did a test-drive and was able to print. When I click the picture of a printer at the top right-hand side of recipe, the print screen comes up, then I click the button that says ‘Pages’ and it gives me a drop down menu. It includes: ‘All,’ ‘Current Page,’ or ‘Page Range.’ I choose Page Range and type in 1-2 and that prints all of the recipe, with only one ad picture. Otherwise, it prints all 3 pages, with ads. These look really yummy. What do you think about adding raw cacoa powder to the mixture?? Sita, I think raw cacoa would be an excellent addition to these cookies. Would love to hear how you like them! How can recipes of this nature be healthy with 1 1/2 cups of sugar? 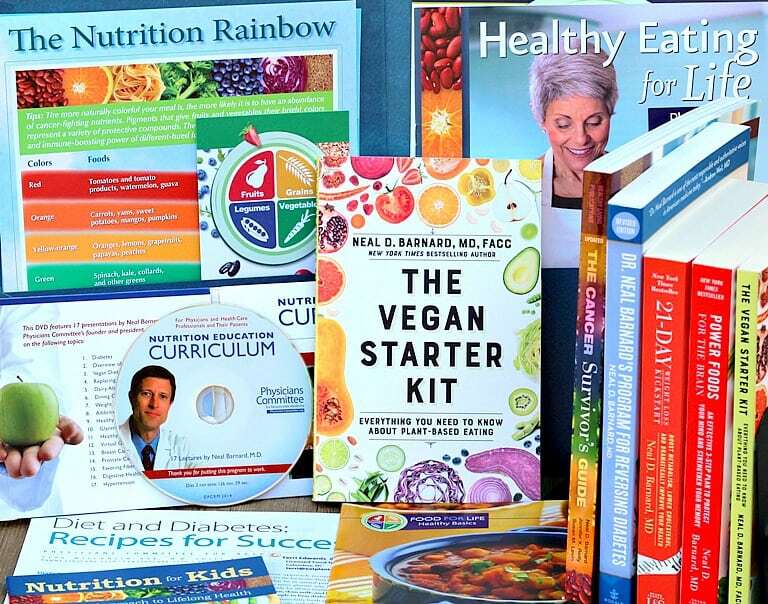 One can not be a sugar or chemical addict and improve your health! It ends up being a little over 1 tsp of sugar per cookie, and they are a decent size–approximately 2-1/2″ in diameter. You can always reduce the sugar or use date paste instead. Would they still be good without molasses? Yes, I believe they would be good without molasses. Happy baking! Do you think the date paste willbe measure for measure with the sugar? It should be fairly close to 1:1. Each recipe is a little different, so you may have to play with it a little bit. Copy and paste to a word document. Then print your word document. I tried these for the first time today! I veered from the recipe slightly and added one very ripe mashed banana I had that needed using up (mixed it with the applesauce) — wonderful treat, thanks for sharing…! Printing from my iPad: if you hit the print button (from FB), it should open up the recipe in white pages (no picture). From there, if you you go up to the upper right-hand corner where the 3 dots are, you have the option to Open in Safari, then you can print. This worked for me. I like to make screen shots of the recipes. However the directions are spaced out under a lot of pictures. Is there a way to get the recipe with directions all in one spot? Yes, just print the recipe using the print button. You’ll find it in the recipe card where the instructions are, under the rating stars (says 5 from 4 votes), and under the photo of recipe. Click on the print button, and you’ll be able to see and/or print a black and white copy without any photos. These were absolutely delicious! My husband loved them. 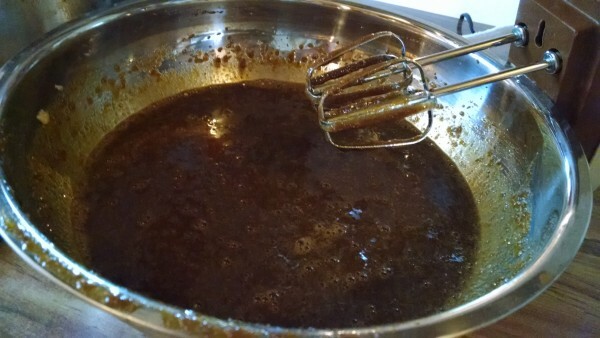 I did leave out the molasses and used Lakanto syrup with maple flavoring. I used erythritol for the sugar. I may try the date paste next time. Wonderful! I’m so glad that you and your husband loved these cookies. They are a favorite here at my house too. Thank you for the great feedback!